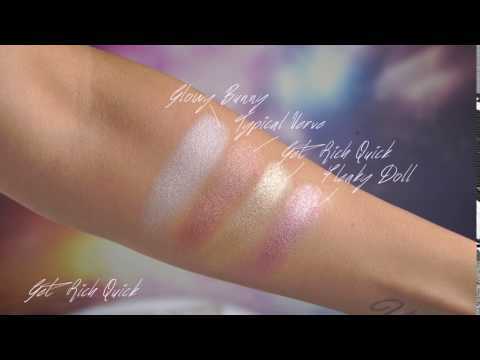 Palette composed of 4 powder highlighters: 2 with a cool undertone i.e., GLOWY BUNNY (white) and FLEAKY DOLL (rose), and 2 with a neutral undertone i.e., GET RICH QUICK (golden) and TYPICAL VERVE (intense golden pink). The shades of these highlighters are particularly indicated for light to medium complexions with a warm or cool undertone. These highlighters have different textures. Two of them (Glowy Bunny and Typical Verve) have a lower percentage of pearls and a thinner texture to ensure a more natural result. The other two shades (Get Rich Quick and Fleaky Doll) have a much higher percentage of pearls and a more buttery texture for a more pronounced make-up look. Its 100% natural ingredients are another distinctive feature of this product. Peso: 6 G/ OZ 0,21 cad. L'inci di ogni singola colorazione, è consultabile nella tabella di riferimento del singolo ombretto.